Even if the infallible Jenny had not piqued my interest in this series, I would have snatched this book up based on the cover (love the stencil-like artwork!) and the title (love overly descriptive titles!). 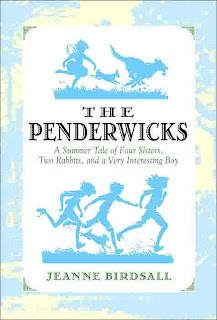 The Penderwicks: A Summer Tale of Four Sisters, Two Rabbits, and a Very Interesting Boy is just a really sweet book to read. I finished it in less than a day and am now chomping at the bit to read the second and third books in the series. This light read won the hefty National Book Award and while I admit I enjoyed the book thoroughly, I can imagine other authors that year being somewhat chagrined by this book winning. The Great American Novel, this is not. There isn't great symbolism. There isn't an epic class struggle. No one encounters racism (or, it appears, other races). It's just a simple story, really- or just a series of vignettes about four sisters and their summer vacation. It's set in contemporary Massachusetts, but takes place in a very isolated setting so feels like it's set much earlier. I really just enjoyed this story because the four sisters- Rosalind, Skye, Jane and Batty- are so fabulous. They all have such distinct personalities, and really interact with each other just as real siblings do. They are loyal, yes, but they also go their own ways. I personally fell very much in love with adorable little 4-year-old Batty (who, I admit, has a pretty impressive vocabulary for a 4-year-old), who wears butterfly wings everywhere and, when scared, tries to hide herself behind urns, sisters and trees, often unsuccessfully. But truly, I liked all the sisters. Rosalind was a bit too perfect as the oldest, always taking care of her younger sisters, being patient and kind and understanding, but she had such a great storyline with her first crush on a boy- it was so true and kindly described by Birdsall. I also loved Jane, who wants to be an author, and the amazing thoughts that went on in her head as she considered the next development in her book's plots. And of course there's the poor little rich boy, Jeffrey, who befriends the girls and whose life is forever changed by them. This is a really lovely tale about girls (and a boy) coming of age- whatever age that might be. They all confront situations that are applicable to their age, face them with courage, and come through with some scrapes and a lot of humor. I'm very grateful to Jenny for bringing this series to my attention- the book was a great delight, and I look forward to reading the rest in the series! You're welcome, and yay, I'm glad you liked it! I also like this "infallible Jenny" business, which seems to take me a step closer to my life goal of having people say "Correct as usual, Jenny!" the way they did to King Friday on Mr. Rogers' Neighborhood. I remember Jenny's review of this book, and when I read it, I immediately thought that this would be a book that I would like. It doesn't matter to me that it doesn't have some huge and meandering plot, as what I am looking for now is just a quiet and lovely read. I think this definitely qualifies, and I am thrilled that you also loved it. This is a book that I need to make time for. It sounds just about perfect. Thanks for sharing your wonderfully enticing thoughts on it with me! Sounds like a perfect summer book! I like the description of Batty. I'll have to add to my to-read list. 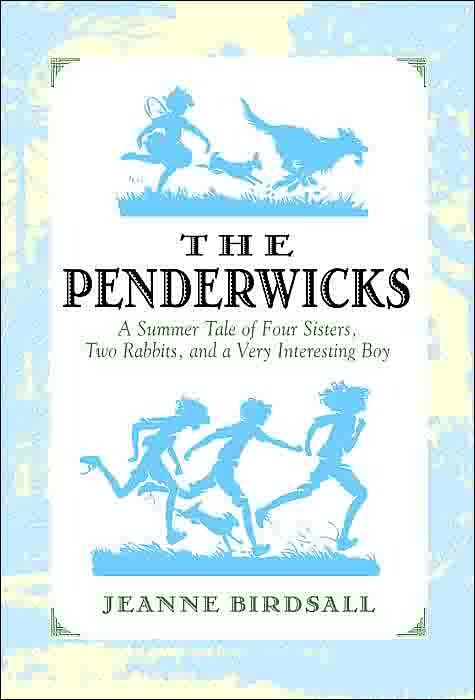 I just wrote about the Penderwicks earlier this week...and I just finished the 2nd one a couple hours ago on my lunch break! And I love how Batty is wearing the wings on the cover! It's great when the cover actually reflects the story. I just finished reading this (picked it up after reading your review) and loved it! So glad you wrote about it. I'm looking forward to reading more by Birdsall.